After a couple of weeks with no meal plans I am looking forward to having some meal organisation back. Last week I didn't get chance to meal plan after holiday and I soon remembered why I started to meal plan. Most nights I was wondering what to cook and rummaging through the cupboards and fridge to see what ingredients I had. At the end of last week we received our first meat and vegetable subscription box. The hubby recently saw an offer for a half price box when you subscribe plus the sixth box free so we decided to give it a go. The meat is of the highest quality and locally sourced. So far I am impressed with what we received. 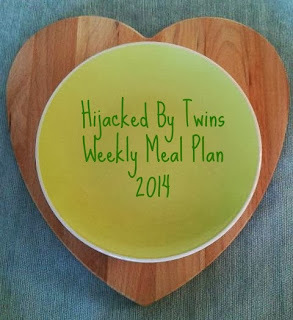 Each week the meat is different so it'll be nice to have different items for meal planning. In the meat box the week was some lovely, lean bacon which I will use to make a carbonara and serve with garlic bread. I will be cooking a salt and pepper roast chicken and serve with new potatoes, carrots, broccoli and corn on the cob. With the leftover chicken I will be making a chicken curry served with rice and naan bread. Shepherds Pie is a family favourite so we will be having it this week. We received a lovely lean piece of topside beef which I am going to cook medium rare and serve with chips, mushrooms, onion rings and peas. This week I am not planning for Saturday as the hubby and I are having a spa day and will be getting a take away on the way home.